Have you ever watched a cooking reality show and wished you could participate, but without the crying, alcoholism, or life-shortening stress? Well, I certainly know I have, and I decided to do something about it! Welcome to my inaugural Top Chef Just Desserts Elimination Challenge …. Challenge! The purpose of this challenge is to re-create the weekly Top Chef Just Desserts elimination challenges at home, and anyone can participate. Just make something that is in keeping with the spirit of that weeks Elimination Challenge on Top Chef Just Desserts, post it to your blog, and email or Tweet me the link no later than 9am Wednesday morning. I will be posting my recipe as well as a round-up of all the other people participating. That is it! The elimination challenge last week was to create a dessert inspired by a cocktail. I wanted to really make this a challenge so I went with my favorite holiday – The Snowball. I first learned of the Snowball from Nigella Lawson from her cookbook Nigella Express, but the spirit used, Advocaat, is difficult to find. Some digging in the net led me to a handy substitute in Rompope, a sort of Mexican version of egg nog with out the spices. To make a Snowball you mix 1 part Rompope, 3 parts lemon-lime soda, and a twist of fresh lime. It sounds strange, but let me tell you it is heaven, surprisingly refreshing, and not too strong. I drink them while wrapping gifts and after three (or four) I am still able to do a passable job of it. The Snowball, I decided, would make a perfect creme brulee. 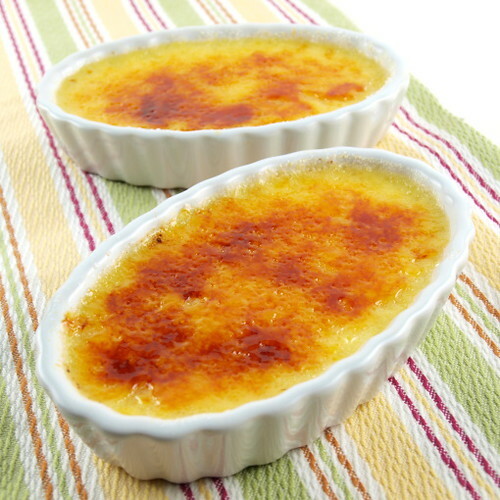 I took a basic recipe for creme brulee, here, and made some adjustments. First, I substituted 1/4 of the cream for Rompope. Rompope is not terribly strong, and it has a mild flavor so I decided to use more than a few tablespoons so the flavor would stand out. Second, I added the zest from one lime. 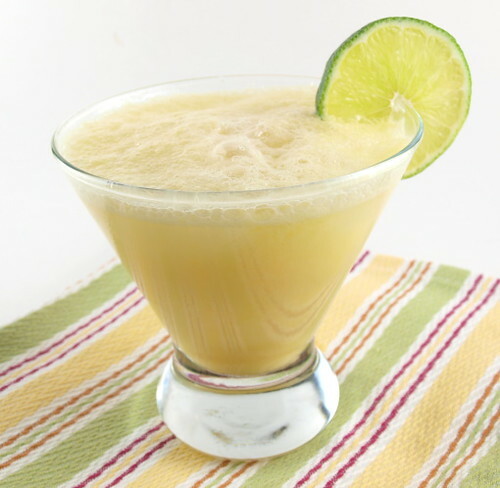 Snowballs have a lovely bright citrus tang that cuts the rich liqueur. Lime zest works perfectly in that capacity. Give the Snowball a try, then give this recipe a try. It is truly the best of the cocktail in dessert form. 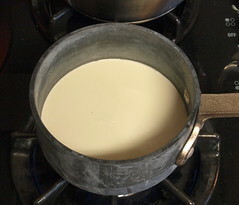 Place the cream in a small pot over medium-high heat and bring to a boil. Turn off the heat and allow to cool slightly. 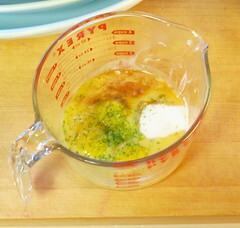 In a medium bowl whisk together the Rompope, 1/4 cup of the sugar, egg yolks, lime zest, and vanilla. 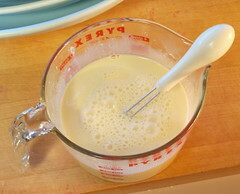 Slowly pour in the cream, whisking constantly. 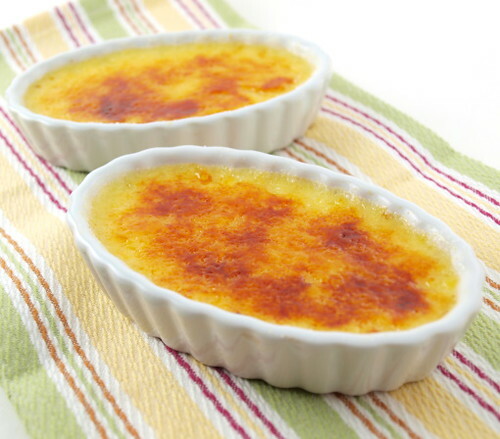 Pour the mixture into 4 (8-ounce) ramekins that have been placed in a roasting pan or baking pan. 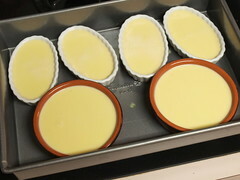 Pour hot water half way up the sides of the ramekins and bake for 30 to 40 minutes, or until firm around the edges yet still slightly wobbly in the center. 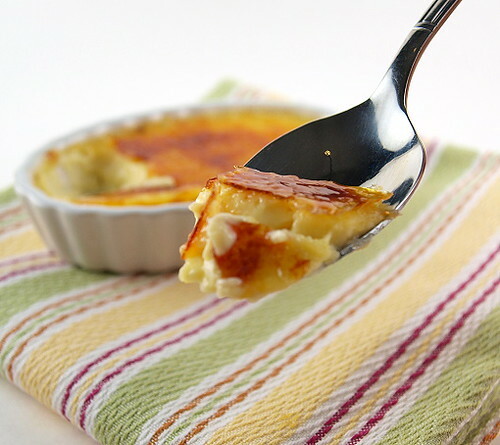 Remove the ramekins carefully from the pan and refrigerate for at least four hours, or overnight. When ready to serve sprinkle the remaining sugar evenly over the ramekins. With a torch, or under a broiler, melt the sugar until it turns amber in color and all the sugar is melted. Be careful not to scorch the sugar. 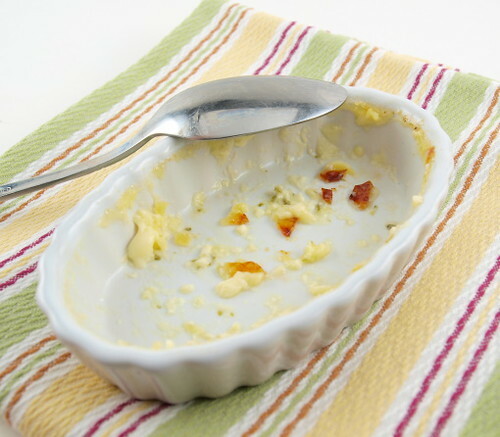 Place the ramekins in the refrigerator for two minutes to harden the sugar. Lara at Food. Soil. Thread. created Hennessy Spiked Apples and Chai Spiced Panna Cotta … It looks AMAZING! Robyn at Earthbound Chronicles made some yummy looking Tequila Lime Cupcakes!